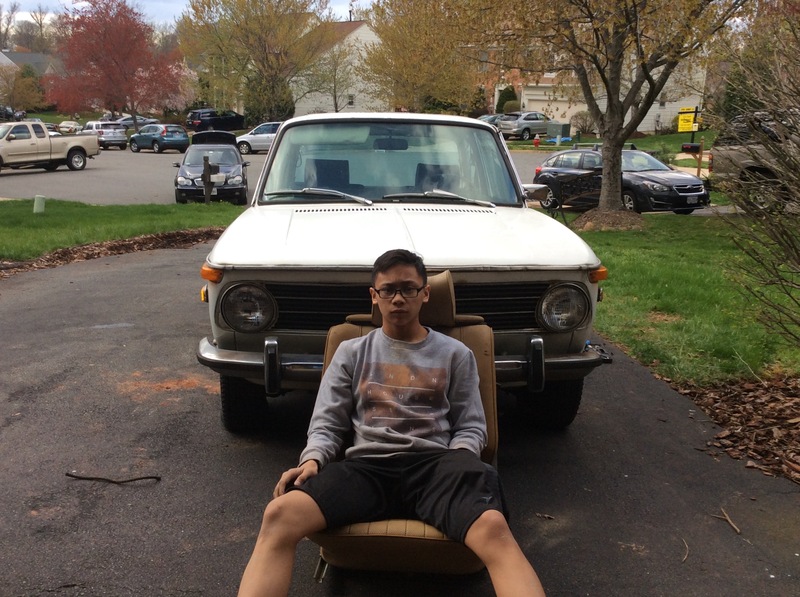 Hello BMW 2002 community, it has been a while. Since I haven't updated this blog in about two weeks I guess I will roll everything we have done into one entry. My last entry regarded our inspection under the hood. Since that time my dad and I have done the following: replaced all the fluids in the car, replaced the fuel filter, replaced the spark plugs, laid a new gasket underneath the cylinder head cover, and cleaned the head liner. Replacing the fluids turned out to be a bit harder than expected. As you know from a previous entry of mine, I am not a "car guy". This turned out to lead to a few problems when we were replacing all the fluids. The first problem that occurred was when we were trying to locate the "transmission filler", not sure if that is what it is called but for the sake of this story we will say transmission filler. After searching for what seemed an hour we found it and replaced the oil, but this was only the first step of our challenge replacing the fluids. The next problem occured when we tried to replace the radiator fluid. Although we drained the fluid with ease, we found that in the actual radiator there seemed to be a hole. So when we tried to pour our radiator fluid down it just came splashing out the bottom. Which leads us to another problem, we need a new radiator. While under the hood, we decided to replace the fuel filter, spark plugs, and gasket in hope that these new items will ultimately lead to us starting the car. With all the priming of the engine finished and the new fuel filter, spark plugs, and a gasket we decided that it was time to attempt to start the car. As my Dad put our newly ordered keys into the ignition I glowed with excitement and anticipation. It was a moment that I had been dreaming about, the roar of the engine, the flash of the lights, and even the smell of the fumes. But when my Dad turned the key, the car wouldn't start, after trying again and again the fuel refused to go all the way from the tank to the engine. We were able to see this because there was no fluid in the filter. All my anticipation was diminished and we were left with so many questions. If anyone has any ideas of why the fuel isnt getting to the engine please leave your advice in the comment section. Thanks! P.S. Sorry I have no pictures. Try to check if there is suction from the fuel pump. You can do this by taking of the hose and put your finger on it while trying to start the engine. And no worries, you will not be sucked into the hose:-). next thing check all hose connections from tank to fuel pump, so that air is not sucked in somewhere. especially on the fuel sender, which have a plastic thing on it to make the diameter be the same as the inner diameter of the hose. This plastic thing use to crack up letting air to be sucked in. Also check the sender, by taking it out. The filter at the bottom can clog up. When installing it again, it is best with new rubber gasket, but you can check the old one, and if it is good, smear a little bit of oil on it. Should be OK then.